Buckle up for Double GTA$ & RP in ALL Races across the board through til end of day this Sunday May 29, including both Rockstar-created and all player-created Races. You can kick off your own Playlist of custom Races, play ones at random or simply hit the prompt button on the GTAV launch screens and launch yourself right into a convenient Double GTA$ & RP Playlist. 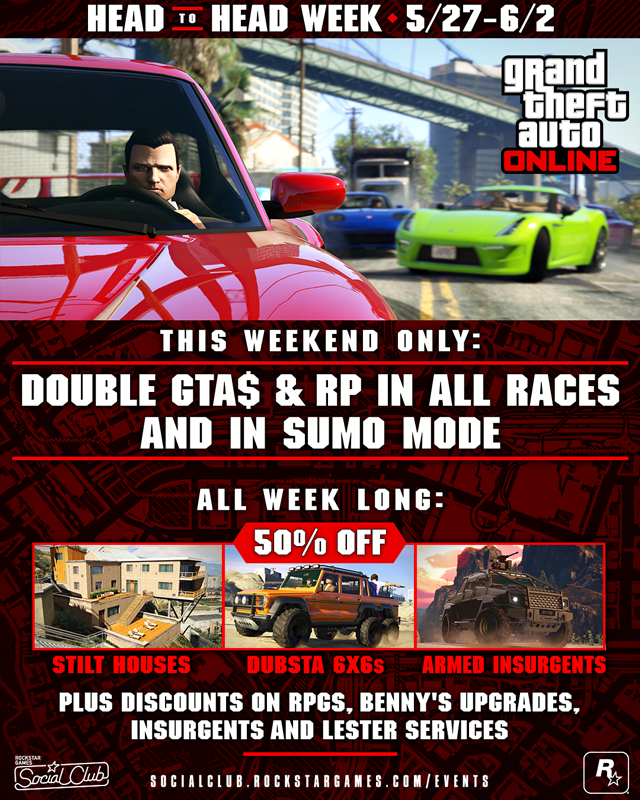 And from Monday through Thursday next week, you can still earn Double RP playing Races in the featured Playlist, accessible from the GTAV boot screens. Additionally, the fan-favorite SUMO Adversary Mode is also paying out the same bonuses this week. Whether you are the last vehicle standing or you are the first pushed out the ring, you will earn Double GTA$ & RP when playing it today through Sunday, and Double RP when playing it in the featured Playlist Monday through Thursday. It is a hot market for prospective Los Santos home buyers as Dynasty 8 is taking half off all Stilt Houses now through next week Thursday. From Vinewood to Rockford Hills, enjoy beautiful, million dollar views from the Hills for just a fraction of the price - hop on the Dynasty 8 website via your iFruit and get settled today! Marry your elegance and supreme ruggedness with the purchase of the Benefactor Dubsta, at half cost all week. When cruising the city streets or tearing through the rough terrain of Blaine County, the Dubsta is up to the task - just make sure you are rank 100 or better to unlock this fearsome 6-wheeled beast. Upgrade from stock cars to supreme rides. Fill the garage of your new Stilt House properly with upgraded Sultan RS’, Banshee 900Rs and many more upgraded Benny`s vehicles all at 25% off. Warstock Cache and Carry, in conjunction with manufacturer HVY Industries, is giving substantial discounts on both Insurgent variants. This week only, purchase the standard Insurgent for 25% off the original price tag. Feel like packing some major heat? Then you will want to pick up the Armed Insurgent for 50% off - terrorize the streets and not your wallet with these spectacular deals. Through next week Thursday, Lester Crest has been kind enough to slash 75% off all his services. If you need to set a Bounty on an enemy, locate a vehicle or have the 5-0 turn a blind eye to your mischievousness, Lester is definitely a contact you want to have. Just find him in your iFruit directory and put him to work. Ammu-Nation is getting in on the savings with a bang, selling the Shrewsbury RPG, Hawk & Little Homing Launcher and corresponding ammo at 25% off. Head on over to any of the 10 locations and stock up all week. GTA Online Head To Head Week - You know the deal. 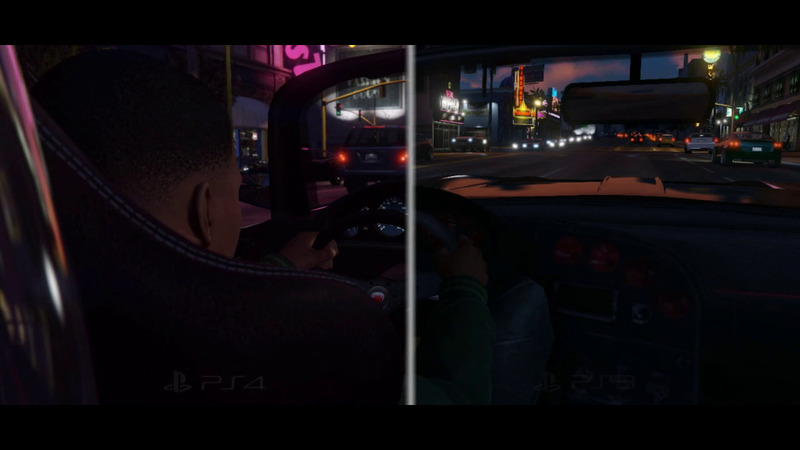 More of everything in new-gen GTA Online. Featuring Races & Sumo and stilt houses among other high-end things.